In July, 2018, the Downey Police Department, in collaboration with the Bell Gardens Police Department and Whittier Police Department, entered into a grant contract funded by the California Department of Alcoholic Beverage Control (ABC). Over the past several months, the Downey Police Department has worked closely with ABC to offer public education training for business owners and their respective employees, in addition to conducting several alcohol related enforcement operations. 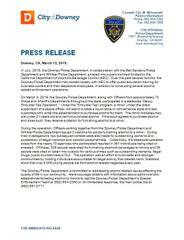 On March 9, 2019, the Downey Police Department, along with Officers from approximately 70 Police and Sheriff’s Departments throughout the state, participated in a statewide “Decoy Shoulder Tap Operation.” Under the “Shoulder Tap” program, a minor, under the direct supervision of a peace officer, will stand outside a liquor store or convenience store and ask customers who enter the establishment to purchase alcohol for them. The minor indicates they are under 21-years-old and cannot purchase alcohol. If the adult agrees to purchase alcohol and does such, they receive a citation for furnishing alcohol to a minor. During the operation, Officers working together from the Downey Police Department and Whittier Police Department issued 2 citations for adults furnishing alcohol to a minor. During their investigations, two subsequent arrests were also made for outstanding warrants and possession of illegal narcotics and narcotic paraphernalia. Collectively, the statewide operation totals from the nearly 70 agencies who participated resulted in 361 individuals being cited or arrested. Of these, 325 people were cited for furnishing alcoholic beverages to minors and 36 people were cited or taken into custody for various crimes such as outstanding warrants, illegal drugs, public drunkenness or DUI. The operation was an effort to build safer and stronger communities by holding individuals accountable for illegal activity that creates harm. Statistics show that over 4,000 young people die from alcohol related tragedies every year. The Downey Police Department is committed to addressing alcohol related issues affecting the quality of life in our community. We encourage citizens with information about patrons and/or establishments selling alcohol to minors to call the Downey Police Department’s Special Enforcement Team at (562) 904-2350 or, for immediate response, the main police line at (562) 861-0771.